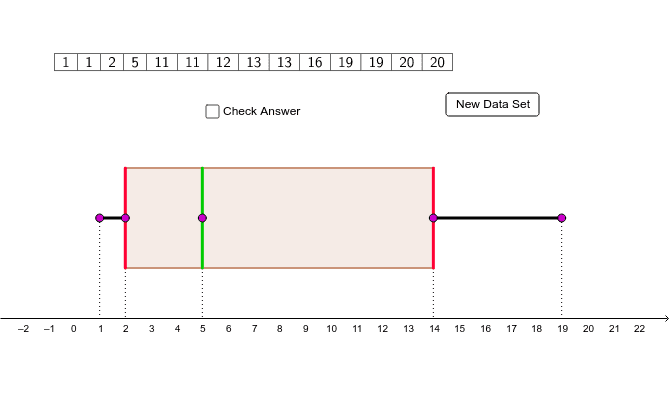 Click on this link: explore box and whisker plots http://math.andyou.com/tools/boxandwhisker.html Trial 1: Input 10 values into the table. Use values between 0 - 100. Write the 5-Number Summary on your scratch sheet. Trial 2: Add 2 more values to Trial 1. Make sure 1 value is much higher and the other value is extremely low. Write the 5-Number Summary on your scratch sheet. Trial 3: Add 20 to 5 different values in your table. Write the 5 - Number Summary Trial 4: Add 2 more values to your table. Either add 2 high numbers or 2 low numbers. Write the 5 - Number Summary REFLECTION: How does the shape of the graph change as you add low numbers versus high numbers to your table? What does the shape tell you about the data? How does a Box-&-Whiskers Plot describe the SPREAD of the data? The Box-&-Whiskers Plot breaks the data into __________ equal groups. Quartile 1 divides the bottom 50% in __________. Quartile 3 divides the upper 50% in _________________. The median divides the ENTIRE data set in __________________. The end of the left whisker represents the ___________________. The end of the right whisker represents the __________________. The shape of the Box-&-Whisker tells you how spread out the data is in each group. The box represents the middle 50%. The left whisker represents the bottom ____________%. The right whisker represents the upper ___________________%.